Are you looking to spruce up the look of your home this spring? Rain chains are a frugal and easy way to add a little decorative touch to the front of your home for added curb appeal. Spring is right around the corner and we all know that April showers bring May flowers. Rain chains come in a variety of styles, colors and finishes making them the perfect addition to any home or business. 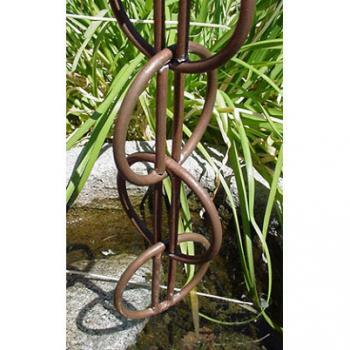 You can choose from rain chain links, rain chain cups, and copper rain chains for the perfect touch! I'll admit that some of them are absolutely beautiful and add a magical touch. Rain chains help move the rainwater downward and are more decorative than the normal rain gutter downspouts. Let the rain pour down! RainChainLink.com is your premiere source for garden rain chains in a variety of colors and styles. By shopping with them you will have a low price guarantee and piece of mind. They offer free shipping on all of their rain chains in addition to excellent customer service. **Brought to you by your friends at RainChainLink.com.